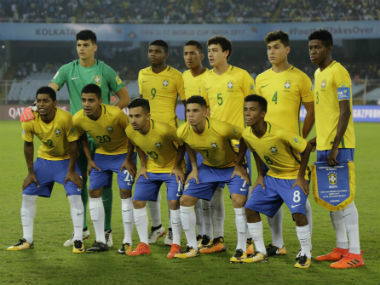 Kolkata(PTI): A goalkeeping howler and Yuri Alberto’s opportunistic late strike were enough for Brazil to beat Mali 2-0 in an uninspiring match and finish third in the FIFA U-17 World Cup here today. Mali goalkeeper Youssouf Koita gifted Alan a goal in the 55th minute against the run of play and then second-half substitute Alberto scored in the 88th minute as Brazil hit their more attacking opponents on the counter in a match that never rose to great heights. The Brazil-adoring 56432 Kolkata fans turned up at the Salt Lake Stadium to make the FIFA U-17 World Cup the most attended tournament in its history but the team, who was defeated by England in the semifinals, did not come to the party and did not play the kind of beautiful football it is known for. In the whole match, Brazil had just three shots on target while Mali, who showed more attacking intent, had 10 hits. The scoreline did not show the whole story but Mali were also to blame as their strikers lack finishing while Brazil goalkeeper Gabriel Brazao made some fine saves to keep them off the score sheet. After the match, the fans reciprocated the Brazilians’ acknowledgement of their support, but they also appreciated with loud cheers when Mali threatened. Nonetheless, the three-time champions Brazil ended the tournament in third position after beginning as the favourites. This was the second time they finished third since the inaugural edition in China in 1985. Mali, meanwhile, went outside a podium finish after ending runners-up in the last edition in Chile. Mali made two changes with captain Mohamed Camara coming in for Cheick Oumar Doucoure and Mamadi Fofana replacing Abdoulaye Diaby as central defender in the starting XI. Brazil did not make any changes from the line-up that started in their semifinal loss to England on Wednesday. The first half was a battle of the midfield between the two sides. Both waited for the other to commit mistakes. Brazil had slightly more possession but Mali attacked more with the action mostly in Brazil half. Mali played with a defensive high line while Brazil played deeper and looked to hit on the break and attempted to beat the offside trap with defence splitting passes. In the 16th minute, Brazil’s overlapping left back Weverson had a left-footed shot after a fine work by Lincoln, but missed the target. Mali skipper Camara had a shot in the 26th minute and Brazil goalie Gabriel Brazao had to dive to his left to save it. In the 40th minute, Victor Bobsin’s defensive mistake led to Salam Jiddou taking a fierce shot from inside the box, but Brazao reacted in the nick of time to tip it over. The pattern of the match did not change much in the second half with Mali looking the side likely to score. But out of nothing, Mali goalkeeper Youssouf Koita gifted Brazil a goal in the 55th minute. Alan snatched the ball from a defender and his poking shot was weak and harmless, but Koita let it slipped towards his left and into the net to the horror of his team-mates. There was no other way out for Mali than press for the equaliser with more man upfront. But Brazil exploited the gaps at the back to the hilt and Alberto, who replaced an off- colour Lincoln in the 74th minute, fired in a low shot past the goalkeeper with just two minute left in the match. Mali made list-ditched efforts to salvage some pride with efforts from Boubacar Haidara, captain Camara, and Jiddou, but to no avail. to beat Mali 2-0 in an uninspiring match and finish third in the FIFA U-17 World Cup here today.